DDT +E – Trim | ECIR Group, Inc. The ECIR Group does not advocate any one device or any specific "hoof-guru" trim. The proper trim is one where the hoof capsule correctly conforms to the bones and supports the soft tissue structures within it. To help assess any descent or rotation of the coffin bone after acute laminitis, every horse should have a set of radiographs. The farrier or trimmer and veterinarian can then better determine the most appropriate approach for each individual horse, taking into account such things as current level of discomfort, current condition of hoof, environment, housing, footing, and even budget. For tips on removing the trigger and treating laminitis in the acute stage, please see the section on Laminitis. After identifying and removing the laminitis trigger, pain reduction and comfort is the next order of business in the laminitic horse. While it may help with body pain, Non-Steroidal Anti-Inflammatory Drugs (NSAIDS) do not work on hoof pain past the acute stage of laminitis. Additionally, NSAIDS will work against the horse long term, impeding recovery. Hoof pathologist Robert M. Bowker, VMD, PhD, has found that in a horse with painful acute or chronic laminitis and founder, nerves are stimulated from the new displacement of bone within the foot: "To alleviate the pain, the horse must be made as comfortable as possible, as quickly as possible, via corrective trim and conformable surfaces." These surfaces might include round pea stone, sand, hoof pads, and anti-fatigue mats. The texture that the foot perceives via the nervous system improves perfusion within the foot and helps reduce pain. Reducing the hoof wall as the loading structure via trim, and the use of softer footing are critical to improve perfusion within the foot, making the horse more comfortable. What is Correct Hoof Mechanism or Function for the Laminitic Horse? In general, hoof function or mechanism is defined as the expansion of the hoof on weight bearing: Weight comes down through the boney column, with traction on the laminae, the dorsal hoof wall moving back, expansion at the quarters and heels, and dropping of the frog and sole. The concept of correct equine hoof mechanism is widely debated. How the hoof functions after an acute laminitis, rotation, or descent is critical to long-term rehabilitation. For the laminitic hoof to heal, the hoof capsule has to be properly repositioned around the bone to transfer forces in a more normal physiological way. An incorrectly trimmed laminitic hoof will not be capable of withstanding the forces of weight bearing in a normal manner for the simple reason that it's not normal. It doesn't matter what you put under the horse's foot; if you put the full weight of the horse onto an inappropriately trimmed hoof with weakened laminae, they'll be damaged further. The white line spreading and quarter flaring you see in laminitic feet occur as a result of weight bearing on hooves with damaged laminae. 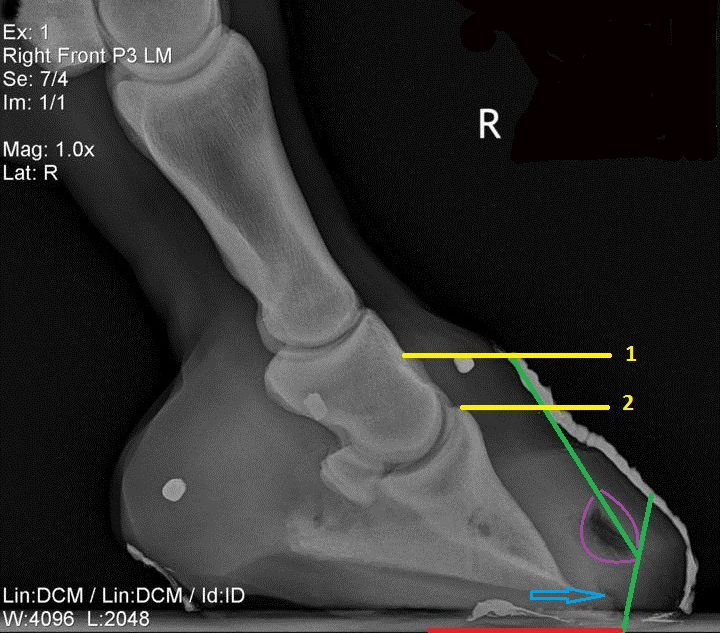 Due to trim techniques that actually work against a healthy foot, internal portions of the foot are too often under-developed for correct hoof function after a laminitic event, affecting blood perfusion and dissipation of energy and vibration. The ECIR Group often follows laminitics with long-term issues with the frog, hoof wall and bars, and elongated sole. During laminitis the effects are visible throughout the foot. The dermis or corium are affected either directly or indirectly by the initial insult to the tissues. Perhaps most interesting is that the long-term health of the foot will reflect the horse's previous history of good physiological function. This means that vasculature and tissue perfusion, as well as the internal bone structure, are a reflection of the horse's total foot health. A correct trim minimizes incorrect hoof function, encourages healing of all foot support structures and healthy lamina connection. It is critical to trim a laminitic foot to a normal alignment of the hoof capsule and the internal structures with the aid of radiographs. If radiographs show coffin bone rotation or descent, the horse will need a realigning trim. The purpose is (1) to relieve abnormal forces that would do even more damage; and (2) to encourage correct hoof wall growth. This involves the trimming required to make the hoof wall parallel with the edge of the coffin bone again, realigning the structures. Over time, internal structures that work for the horse for healthy blood perfusion and energy dissipation may be restored. If the amount of rotation or descent is not severe, a realigning trim can often be done simply by backing up the toe through the white line. If that does not fully correct the hoof wall/coffin bone alignment, the toe can be beveled so that the point of break-over at the toe lines up with where the hoof wall should be to correspond with the new position of the coffin bone. The bottom of the coffin bone should be sitting no more than 5 degrees above a ground parallel position. 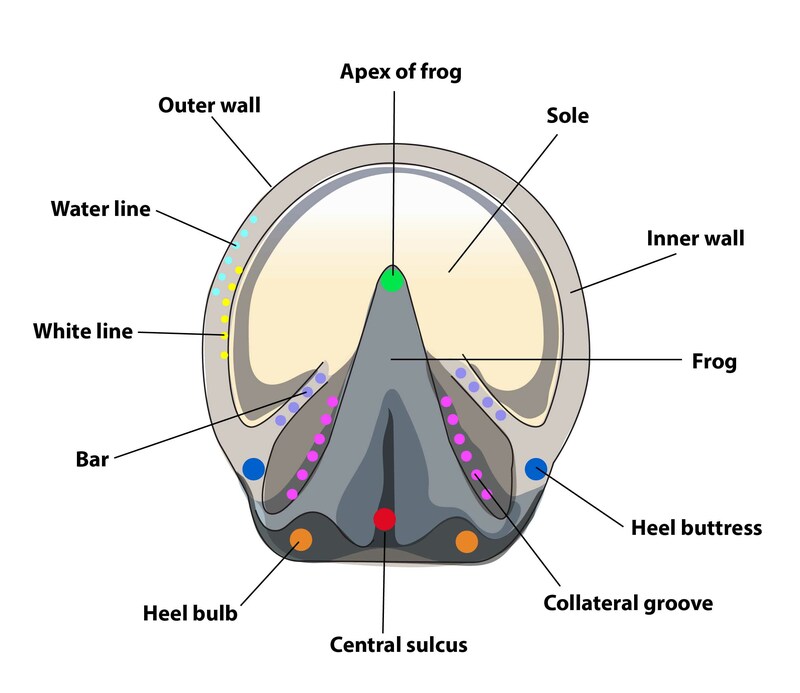 A broad base of support involving the frog, internal caudal foot structures, and the coffin bone reduces the weight upon the hoof wall during loading of the foot. The soft-tissue damage between the hoof wall and the coffin bone needs to be minimized quickly after an insult to the tissues. Unloading the wall as much as possible is the simplest way to accomplish this effect. By increasing the surface area of the loaded foot via the solar surface, the pressure inside of the foot and its tissues will be less. Dr. Bowker refers to this as "the sneaker effect". Shifting the weight from the hoof wall to other surface areas is the best way to allow the foot to begin to heal. An equally important part of treating laminitic feet is to discourage full hoof mechanism through the environment the horse lives on, i.e., through conformable surfaces: padding, sand, pea stone. Soft surfaces are more comfortable and safe. Frequency of the trim is critical to keeping the foot functioning as it should during rehabilitation. In the initial stages, most horses benefit from trims at two-week intervals. 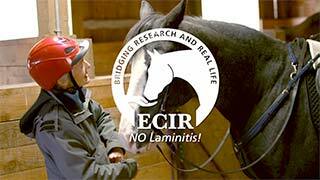 Too many horses fail to recover from laminitis due to incorrect trimming. A variety of devices for the laminitic horse are on the market. Some are simple, while some are far more intricate. Each and every device is doomed to failure without a correct trim. It is important to realize that each horse comes to this stage in their lives with a history of good or bad hoof care that significantly impacts the internal structures of the foot. Individual and even small environmental factors may make the difference between the successful recovery of one horse and the unsuccessful recovery with the same product for another horse. The principles of a realigning trim are correct for every horse, although the degree and type of damage, as well as the starting condition of the feet and environment/housing, will vary greatly. Any one device claiming to be the only way to fix a laminitic foot is just wrong. Anyone that puts a horse into a device without doing a correct trim is setting up the horse for failure in the recovery process. Shoes or hoof casts limit hoof expansion and give the professional more options in unloading particularly weakened areas of the hoof if that is needed, but have a major drawback of not allowing easy access to the hoof for frequent trims and long term they may result in feet that are not as structurally sound and robust as bare feet. Most feet can be dealt with very effectively with correct trimming, pads and boots and do not require shoes or casts. But some do benefit, and when dealing with a laminitic horse — especially a chronic case with long-standing hoof deformity — you should never limit your treatment options based on arguments that don't apply to laminitic feet. Often if the horse is in shoes, the atrophied frog is elevated from the ground and not doing the job of bearing weight and dissipating energy. The foot is often also suspended by the hoof wall, further weakening laminae. Physiological function of the foot is thus compromised. Movement: Opinions vary widely on how much movement the laminitic horse should do. It's very true that movement is beneficial for circulation and circulation is beneficial for healing. However, circulation benefits only occur if the hoof capsule is mechanically correct and few are, even before the horse becomes laminitic. In the acute phase, when pain is being masked with pain medication, the horse should be confined while on the drugs to prevent further damage. After the drugs have been stopped, movement in a small enclosure with supportive footing can be allowed as desired by the horse. Pain indicates damage. Never force a painful horse to move. This is the equivalent of walking on a broken leg before it has any healing. Raising the Heel: Raising the heel, or cutting the deep digital flexor tendon (DDFT), allegedly to reduce the pull of the deep digital flexor tendon on the coffin bone, are both widely recommended and widely condemned. There is really no proof anywhere that raising the heel does anything to prevent rotation. The theory is that the DDFT pulls on the coffin bone (it attaches to the undersurface) and causes it to rotate, but this ignores the action of the digital extensor tendon pulling in the opposite direction. The theory of DDFT pull also fails to explain why horses with the most extensive damage sink or how sinkers can have a perfectly aligned boney column with no rotation at all. In fact, some sinkers are more ground parallel than before the laminitis. Raising the heel has negative effects long term by increasing the pressure on the tip of the coffin bone and accelerating bone loss. Long Toes: The most common issue seen on the ECIR group is a long, horizontal toe with a thin sole. Long toes function like the engine on a runaway freight train. They drag the soles, frogs, and heels along with them, thinning depth and distorting all of the landmarks that are used to determine where to trim. They create lever forces on the laminar connections, tearing them with every step taken. Recognizing where the foot should be and reducing horizontal length are the first steps in achieving more sole depth. Anytime there is a thickening of the sole material at the front edge of the hoof, especially if it looks a bit chalky, irregular or flaking — it is dead, exfoliating sole that has run forward. In a correctly balanced foot, toe callus forms under the leading edge of the coffin bone as a layer of thick, tough protection. It does not form in front of the coffin bone nor does it cover the white line.